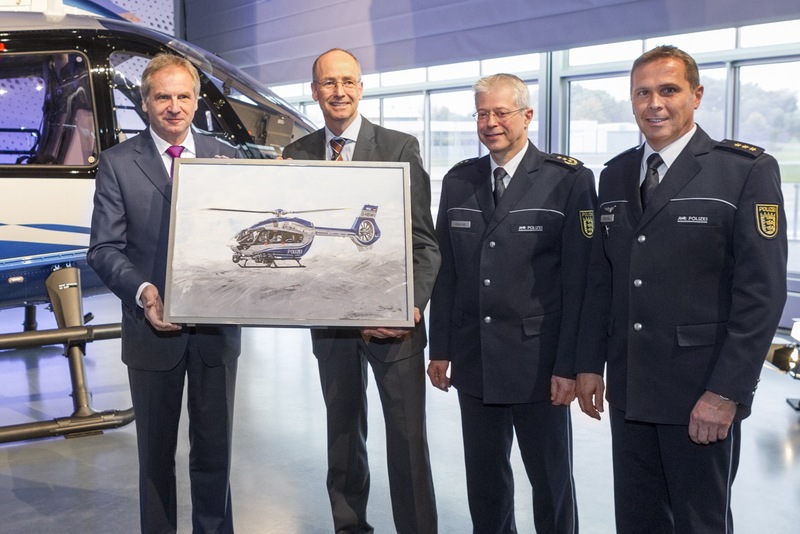 Donauwörth, 19 October 2015 – Today, the federal-state police of Baden-Württemberg took delivery of the very first H145 in police configuration at Airbus Helicopters’ industrial site in Donauwörth. The aircraft is the first of an order of six to be handed over to the launch customer. “It is of the utmost importance for our police to be able to rely on the quality of their resources in order to meet the challenges of their daily missions. With the acquisition of a total of six new police helicopters we guarantee the high quality standards of the squadron. I’m particularly pleased with the fact that with the world’s most modern police helicopter H145 Baden-Württemberg is once again a pioneer in terms of technical innovation in our country”, said Reinhold Gall, Minister of the Interior of Baden-Württemberg. As the new reference helicopter for law enforcement, the H145 features all-in-one capabilities: deployment of Special Forces units, VIP transport, external load, as well as observation and reconnaissance.It is equipped with a modern mission management system by Euroavionics that facilitates the multi-role capabilities in police missions. The MMS, in combination with comprehensive connectivity options such as LTE and Wi-Fi, makes the aircraft the most modern police helicopter on the market. Its primary surveillance mission is supported by forward-looking infrared (FLIR) and daylight cameras, controlled by an on-board operator who also handles communications and data exchange with ground-based police resources. As one of the three largest German States in size and population, comprising the major cities of Stuttgart, Karlsruhe, Freiburg and Mannheim, the helicopter will cover an area of roughly 36,000 km2. The H145 is the latest member of its family, incorporating new Arriel 2E engines and the company’s Fenestron® shrouded tail rotor, along with upgraded main and tail rotor gearboxes, as well as the innovative digital avionics suite Helionix® with 4-axis autopilot. The federal-state police of Baden-Württemberg currently have a fleet of two EC155 and six MD902, which is to be succeeded by the H145. Police forces throughout the country will soon be operating an all-Airbus Helicopters rotorcraft fleet. Airbus Helicopters is the global leader for the law enforcement market with 45 percent of the deliveries in the last ten years. In Europe, the light-twin H135 and H145 families are the most successful helicopters in this segment with approximately 40 percent of the in-service fleet.